$400,000 IN EQUIPMENT AND IMPROVEMENTS ALL YOURS FOR THIS UNREAL PRICE! 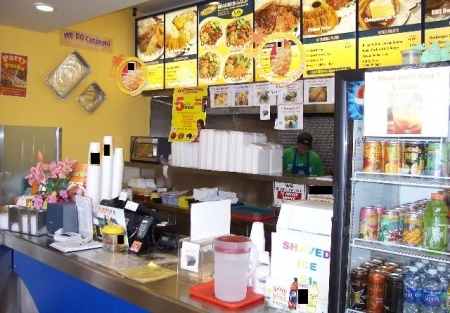 Currently operating as a franchise Hawaiian BBQ restaurant, this hard to find asset sale location is perfect for a Mexican Restaurant, breakfast and lunch cafe, Mediterranean, or any style BBQ restaurant. This restaurant is located right off of Interstate 10 in Ontario, with easy on and off! The franchise is not included, but wait until you see inside! No expense was spared in the building of this location, and now their loss is your gain! Starting off with a beautiful dining area with seating for 28, with a nice tile floor with 4' tile wings coat on the walls. Followed by a well thought out cook line, and an awesome kitchen area with stainless steel from floor to ceiling throughout! Separate walk-in refer and freezer, and plenty of storage space. 1,405 total square feet of space. Base rent is $2.25 Sq. Ft. with CAM at .65 Sq. Ft. Total rent is $4,074 per month. THE BUSINESS-FRIENDLY LANDLORD IS READY TO NEGOTIATE YOUR NEW LEASE!! This is a MUST SEE! Once you do, you will be SOLD. Select one on the orange buttons below, register at no cost or obligation, and receive more photos and the address of this location. This is a Business Intermediaries, Inc. listing. New 5 year lease with options! All kitchen Area Is Stainless Steel From Floor To Ceiling! Base Rent $2.25 per Sq. Ft.
CAM .65 per Sq. Ft.